Air power is becoming increasingly the focus of the Asian arms race. Depicted is the Su-27SKM Flanker, a block upgrade or new build variant which best compares to a multirole single seat F-15E variant. The aircraft has smart interfaces for a wide range of Precision Guided Munitions (KnAAPO). This paper is based on a supplementary submission to the JSCFADT Inquiry into Australian Defence Force Regional Air Superiority, a subject that has assumed increasing importance as Defence decisions taken over recent years have been seen by many to deny Australia's ability to achieve regional air superiority over the next 30 years or more. The paper emphasises important aspects of air power and air superiority, the core concern of the Inquiry, and draws parallels between the parlous situation now facing the RAAF and the USAF. Unfortunately, the Inquiry advised that the Committee was now in the process of reporting and that no more submissions would be accepted. It is hoped that the points made in the paper will be of interest to those concerned both with the future of the RAAF and the role and application of strategic air power in our region. In following the submissions made to the JSCFADT Inquiry into Regional Air Superiority, there appeared to be a marked reluctance on the part of Defence to debate air power issues in an open manner, one designed to determine what, rather than who, was right. This was in marked contrast to the pre-DRP days when few problems arose with the RAAF's methodology for the selection and support of new air power capabilities. Decisions taken by Defence in regard to the early retirement of the F-111 and the unnecessary early commitment to the JSF for both fighter and strike roles were not open to expert debate, the decisions rapidly became entrenched and any opinions to the contrary were denigrated as contrary to the 'party line'. Finally, there developed the perplexing situation where Defence professed a clear policy in regard to ensuring that Australia maintained regional air superiority, but then took a series of decisions that ensured that this could not be achieved. The selection of the Super Hornet interim fighter was the last and most blatant example of this enigma. When the Inquiry had run for some time, without change in Defence's attitudes, this paper was written to highlight those issues that should have changed, but had not, and those that had risen in priority but had not been considered adequately. A main area lacking in any development relates to the Defence bureaucracy and its continued refusal to place before the JSCFADT Inquiry or the public any supported analysis or logical argument in support of its plans for the early retirement of the F-111 force, or the selection of an aircraft (the JSF) which will clearly not provide the degree of air superiority that Australia has enjoyed from about 1943, but has now lost. Current Defence planning is focussed wholly upon small 'joint' operations and ignores the rapidly developing strategic changes in our region. As a result, present planning will not provide the force structure that will best meet the emerging long-term threats to Australia. The decisions taken within Defence in regard to the retirement of the F-111 and the selection of the JSF represent a dramatic realignment of Australia's Air Power structure, switching from an emphasis on air superiority and deep strike capabilities to battlefield and close air-support roles. The resulting, adverse impact upon Australia's diplomatic and military credibility in our region will be no less dramatic. The recent plan by the Defence Minister to introduce Super Hornets, reportedly to fill the capability gap that will result from the unnecessary early retirement of the F-111 and the entirely foreseeable delays in the delivery of the JSF, are representative of entrenched problems caused by a fundamental lack of appreciation of Air Power and an inability to conduct rigorous force structure and technical analyses capable of withstanding review. Both seem symptoms of a poor organisation with inadequate technological and management skills. The introduction of Super Hornets is not a defensible policy as they will not provide the level of air superiority that Australia needs. Finally, there has been constancy in the approach developed by DMO when planning the procurement and support of new equipment acquisitions, particularly those impacting Australia's Air Power capabilities, which may well have a long-term, adverse impact upon Australia's independence of action and self-reliance. Air Power-The Nub of the Argument! Control of the Air. Described broadly as a (single-Service) role which comprises establishing and maintaining air superiority through offensive and defensive means. Precision Strike. Another (single-Service) role which aims to strike so as to destroy or neutralise enemy targets. The 3rd Issue of the Air Power Manual distilled well the unique position held by Air Power when it pointed out that control of the air 'is almost invariably a pre-requisite for successful defensive and offensive military operations on and beneath the sea, on the ground, and in the air'. This is a fundamental truth which has stood the test of time and technological change since the aircraft was first used as a weapon of war. Perhaps, not surprisingly, this truth is often forgotten when one has enjoyed air superiority for some time. The Defence bureaucracy, however, seems to be far less clear as to the role and importance of Air Power to Australia's long-term security when its force structure and development plans, coupled with the support decisions being taken within the Defence Material Organisation (DMO), are examined. Defence's rush to embrace anything American as being appropriate to Australia's best interests may be central to many of the problems that seem to re-occur. Defence seems habitually to pick and choose bits and pieces of American systems, but leaves behind the most important elements. For example, it picks up parts of the US's planning approach, but fails to adopt those critically important force structure planning disciplines detailed in AFDD-1-1. It seems to be incapable of taking up the more intellectually rigorous, albeit challenging, task of analysing Australia's strategic environment and developing an appropriate force structure. At this point, it is important that the Air Power situation in the USA be examined, as it will give us an insight into some of the major problems shared by both the USAF and the RAAF. For the past twenty years, US military planners have had to live within a confused and often contradictory environment. The 'end' of the cold war saw drastic reductions to the Services' budgetary allocations, which led to the deferment of new system purchases and prompted continuous extensions to the service lives of the old technology systems being operated. These challenges were not managed well. The primary onus for the defence of the US, which should have rested at the political/Defense Department levels, shifted largely to the military who were forced to manage the ever-changing complexities as best they could within ad-hoc financial constraints and priorities, and the imperatives of vested political interests. For the past five years or so, America's attention has been focussed wholly upon Islamo-centric security, essentially the 'Global War on Terror', causing it to lose sight of the grinding shifts in the tectonic plates of the world's major states, especially those of China, Russia, and India, with only spasmodic and ineffective attention being given to the dangerous flashpoints that have developed in North Korea and Iran. Over this time we saw an inability or unwillingness develop within the US Department of Defense to understand military doctrine, especially Air Power, coupled with a propensity to abrogate decisions that quite logically and rightly resided with the Military. The results can be seen today in the political turmoil in American politics and the situation in both Afghanistan and Iraq where civilian decisions on military strategy and tactics remain a principle cause of the seemingly intransigent problems that are entrenched there. The loss of life on all sides and the horrendous costs involved have robbed the US of much good will around the world, damaged its political credibility, and dissipated the resources so sorely needed to develop the type of modern military capabilities best suited to current and future world threats. The USAF operates 45 year old aerial tankers, and current planning for their replacement is apt to see some tankers retired at 80 years of age. Its F-22 program has been cut back by 75%, even though the legacy fighters this aircraft was designed to replace operate under flight restrictions. Transport aircraft production lines are closing down, despite urgent in-theatre USAF needs. Radar and reconnaissance aircraft replacements have been cancelled, despite their role becoming more critical. While the JSF will, hopefully, be a welcome addition in some roles, it is interesting to note that the F-22 has been raised periodically in priority to keep it flowing into the USAF's inventory. While the importance of Air Power may not be appreciated in many quarters, the USAF is well aware that the F-22 is its only means of achieving air superiority against the advanced technology aircraft coming off the production lines in Russia and China, and now entering our region in numbers. The large scale block obsolescence of the USAF's aircraft, coupled with distortions in America's current force structure, represents a massive challenge to both America's will and budget that has yet to be acknowledged and redressed by the executive and Congress. In the meantime, the USAF, in capabilities and doctrine, has reached the point that some US analysts define as 'The Death of US Air Power'. There are many similarities between the USAF's experience and the RAAF's. Some of the more important have been covered well by Colonel Tom Ehrhard PhD (USAF) (retd) in his recent 'Wish for the USAF in 2007'. Extracts from his wish are attached and are highly recommended for reading carefully by all interested in Air Power and air superiority and the state of health of our RAAF. The similarities are such that some local analysts are now seeing the situation the RAAF faces in terms of 'The Death of Australian Air Power'. However, it is heartening to see the USAF now asserting a more positive stand, firstly with the 24 foundational statements (which include 'ten fundamental truths') written into its recently-released Air Force Document 2, 'Operations and Organization', and secondly in the military doctrine espoused in the RAND Study 'Learning Large Lessons', released August 2006. The factors given in Document 2 reaffirm that Air Power is not now, and never could be, 'auxiliary' in any way, while the RAND Study states that experience of the last five wars shows the Pentagon's joint doctrine 'must be overhauled' relative to the roles of air-and land power. The question that arises here is: Why is our Defence Department so set upon adopting strategies and policies that have been discredited in practice and theory? 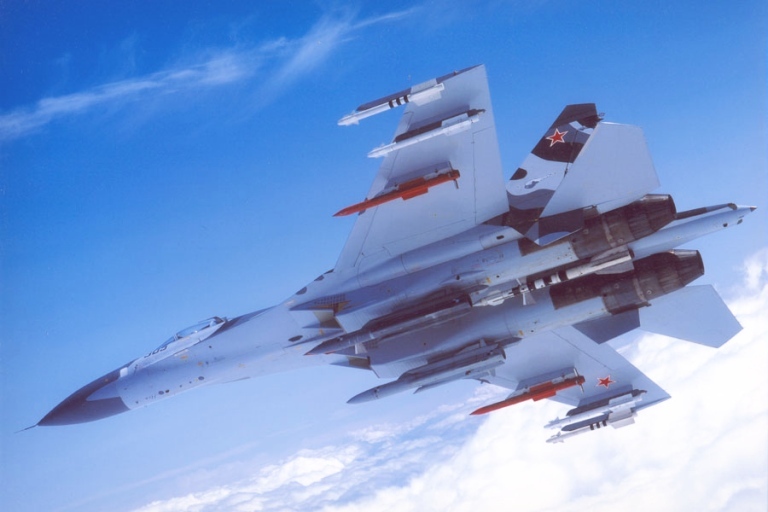 In assessing the threat posed by advanced Russian Sukhoi aircraft, the JSCFADT Inquiry, in July 2006, recorded that 'There were insignificant numbers in the region', a situation much underestimated then and since by both Government and Defence. Preceding this statement and since, we have seen a concerted push by Russia to market advanced military equipment into our region, particularly to Indonesia which has now entered into agreements with Moscow covering large arms, energy, and trade deals. However, it is not only the appearance of highly-capable Sukhoi aircraft in Indonesia, Malaysia, Thailand, and Vietnam (not to mention India and China) that is of concern, but the associated proliferation across our region of Russian and indigenous Precision Guided Munitions (PGMs). When combined, these capabilities will tip the strategic balance in our region. It is important that Australia recognises that our neighbours are seeing military power essentially in terms of Air Power, based on the simple, but unarguable, premise that air superiority and PGMs win wars and serve as first rate deterrents. Unfortunately, Australia's attention and resources have been diverted away from longer-term strategies and capabilities by 'The Global War on Terror', as happened in the US, with precisely the same results for Australia's Air Power – a strategic in doctrine from air superiority and deep strike capabilities to a much narrower battlefield mentality – and with precisely the same confusion about the role of Air Power and the associated long-term strategic risks. Within the evolving air environment in our region, the JSF will have little, if any, chance of survival, even given the 'decisive advantages' that will somehow be conferred upon Australia (and remain ours) with Defence's proposed Intelligence Surveillance Reconnaissance (ISR) and networking capabilities. Australia needs a fast, robust, long range, air superiority/strike air combat fleet of aircraft capable of continued growth over the many years it will be operational. In terms of new aircraft, the choices are quite limited and really come down to one or more variants of the F-22, the only new generation Western aircraft that will be credible strategically in our post-2015 environment. The F-22 would, in effect, give us a degree of deterrence and capability closer to that which has been provided so successfully in the past by the F-111, and yet Defence refuses even to consider the possibility! Similarly, Defence refuses to consider the significant complementarity in capabilities that our existing F-111 aircraft, or an improved Australian Industry evolved variant, would have with the F-22, especially in the roles of deep strike and cruise missile defence. Firstly, the decisions regarding the F-111 and the JSF rule out Australia recovering and maintaining air superiority in our region. Importantly, Defence's bid to retire the F-111 early will certainly see the disbandment of the highly successful and economic F-111 Weapon System Business Unit at Amberley. Despite the fact that this facility should be developed as a critical, key, Australian-controlled facility to provide system support and development for our future high technology aircraft, it is doubtful that Defence will be able to resist the temptation of taking perceived short-term savings and the seemingly easy way out by vesting system support and development with firms overseas. The RAAF's force structure has been distorted virtually to exclude air superiority and deep strike capabilities as core roles, in direct contravention of Defence's own stated doctrine! Emphasis is now on narrowly specialised battlefield support, an unnecessary waste of critical Air Power. As a result, we are becoming less well structured and less capable, rather than better. Maintenance, engineering, and supply support, particularly in the high technology/high value/high skills areas, will migrate to overseas facilities in an effort to 'simplify' management, transfer risk, and reduce costs. This has already started with our AEW&C and C-17 aircraft. RAAF manpower and skills will be further reduced as a result. The Service will become, in effect, a small appendage of the USAF and/or the USN, its capabilities constrained by having to deal through the prime support channels and contractors of these two services. Our local aerospace industry will steadily disappear in all but some low value, low cost, and low skill areas. Each step along this path will in turn result in a steady erosion of Australia's much vaunted 'Self Reliance' and independence of action. Australia's security will depend directly upon long and expensive external lines of support over which it will have little, if any, real control. Australia's security will risk becoming hostage to the political will, priorities, and capabilities of another State. 'It puts Australia in the position of depending upon the deployment of US Air Force and Navy assets in any larger regional contingency. It effectively amounts to passive acceptance of a strategic position in which Australia must align itself completely to one of the major players and in which Australia loses its capability to determine its own courses of action, becoming a vassal state'. (Myths, Facts, and the RAAF Force Structure –Air Power Australia Analysis, APA-2004-04). In short, is Australia to enjoy a credible and independent diplomatic/military capability in our region or are we, in effect, going to outsource that as well? FSD Raptor 002 refuelling from a Boeing KC-135E Stratotanker. 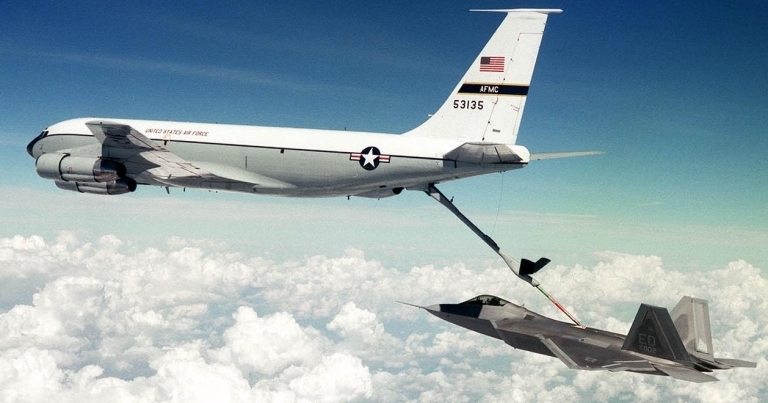 The F-22A is the latest technology, yet the KC-135E it is refuelling from was built during the early 1960s. The US faces a crisis in recapitalising its Cold War era aircraft fleet (US Air Force image). Extracts of comments made in response to 'Reflections on 2006', Air Power Australia Analysis 2006-03, dated 30th December 2006. What is the state of the USAF's operational, technological, and strategic planning machinery? (A response to a question put in relation to the RAAF in Reflections on 2006). What has become of centralized control (BY THE SENIOR AIRMAN), decentralised execution? What is the Air Force's strategic future, and what are its competencies? Does the Air Force have anything meaningful to say about US military power in the 21st Century other than 'we support others'? Perhaps at the core of this, is the Air Force a service or is it a collection of people wearing the same uniform? The essence of aerospace power is the control of air and space, which has its own strategic effect and remains the essential precondition for all US military operations. The exploitation of air and space, i.e., aerospace options that become available when one establishes control, continue to be of increasing importance to US national security at every level of war/relative to, and in concert with other military means. These two propositions present a threat to legacy, surface-centric world views, and as such require energetic advocacy to expedite their full incorporation into a more enlightened, progressive, and effective means of conducting American warfare and diplomacy. Airpower isn't just a product; it's an alternative, a disruptive idea, a revolutionary American perspective that has continuous, increasing importance to US national security. It retains that increasing importance EVEN WHEN IT'S REJECTED. But, in order to be either accepted or rejected, it must be injected. There are only two real measures of merit-whether American Airmen have a unique, meaningful, relevant perspective, and whether they make it part of the debate. We need a lot of work on the former, and need to at least register a pulse on the latter. Airpower must inevitably be presented as a counterpoint, that is, as a meaningful alternative that springs from its nature. A counterpoint has relevance only in contrast to another perspective, which implies conflict. Airpower cannot be presented in an environment of consensus or comity because the theologians of the dominant paradigm won't allow it. This is the essence of the Billy Mitchell Syndrome---if you present an alternative Airpower alternative forcibly enough to make an impact, you are branded as divisive, but if you are timid or circumspect, you will be ignored. They leave us no middle ground, although the more timid among us have been searching for it in vain since 1903. Thus, to re-militarise, we must find courage. That is my wish for all of us in 2007. This same wish should also be sent to the RAAF for precisely the same reasons.